Schwartz & Wade, 9780375835971, 40pp. This School Library Journal Best Book of the Year celebrates everything butterfly, from migration to metamorphosis! 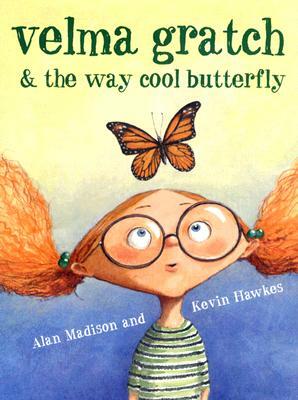 Kids will love reading about Velma's own transformation from a timid first grader into a confident scientist. It's hard to be Velma entering first grade. That's because everyone has marvelous memories of her two older sisters, who were practically perfect first graders, and no one even notices Velma. But all that changes on a class trip to the butterfly conservatory, a place neither of her sisters has been. When a monarch roosts on Velma's finger and won't budge for days—no one will ever forget it . . . or her! Here's the perfect addition to any science curriculum. Alan Madison is the author of some very funny books for children, including The Littlest Grape Stomper, and Pecorino Plays Ball. He lives in New York City. Kevin Hawkes has illustrated the New York Times bestselling Library Lion and My Little Sister Ate One Hare. He lives in Gorham, Maine.